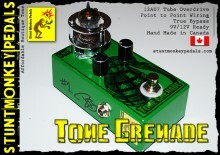 The SMP Tone Grenade uses a 12AU7 tube for a clean boost all the way up to a mild bluesy overdrive. 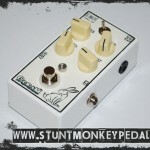 This pedal will add that ‘tube tone’ to any solid state amp and gives additional rich harmonics. Nothing fattens up your sound like a Tone Grenade! The SMP White Rabbit will punch you in the face and spit on you while you’re down. You can dial in a mild buzz up to a wall of Fuzz! 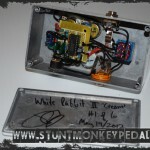 With the Voltage sag and Tone control, you get a dynamic range unavailable in other fuzz circuits. 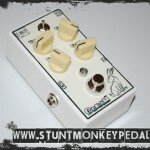 The SMP White Rabbit runs off any 9 volt Boss style negative tip adapter. 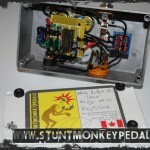 At Stunt Monkey Pedals, we recommend the 9V Visual Sound One-Spot for use as it will provide plenty of clean power to this and many other pedals all from one small adapter. For more headroom, a 12V adapter can be used.. 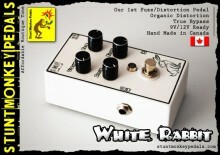 Check this link for an independent review of the White Rabbit’s tones and capabilities. 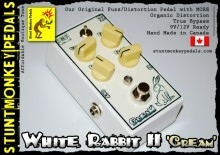 The SMP White Rabbit II will punch you in the face and spit on you while you’re down just like the original circuit, but when you flip the switch it’s a whole new animal! Think Yeti on steroids in a rabbit suit. Yes, it’s that cool! 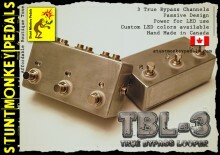 The SMP TBL-3 is a passive True Bypass Looper that offers ease of use and pure tone transfer! The SMP TBL-3 offers three independent channels with LED indicators to show which are active. It can be run without power, but to have the LEDs activate you will need to connect to your existing daisy chain or an independent power adapter. Any Boss style negative tip adapter will work. 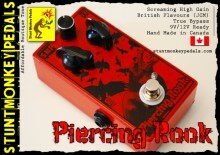 Why add wear and tear to your valuable vintage pedals, stop stomping on them and use a true bypass looper! These are built to last, made out of the same quality components used on all Stunt Monkey Pedals and they come with the same guarantee for a 100% satisfaction.